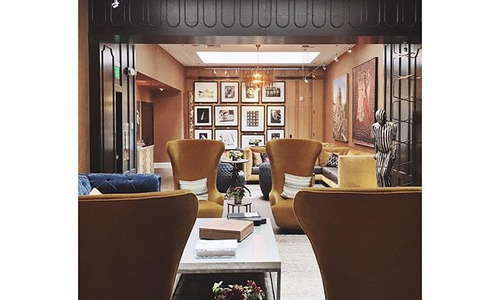 If you’re looking for a classy hotel that pulls out all the stops to make you feel at home in the City of Roses, look no further than Hotel Lucia. 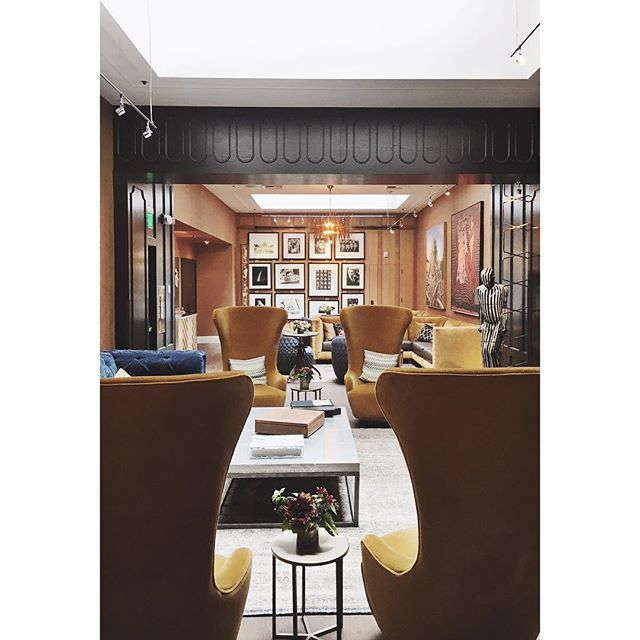 Built in 1909, the building’s classic architectural details juxtaposed with contemporary decor creates a truly elegant feel, while the hotel’s laser focus on guest experience ensures one of the best hotel stays in the city. Traveling with your pup? Hotel Lucia doesn’t just pull at all the stops for their human guests - they want to make sure your four-legged friend has just a positive experience. 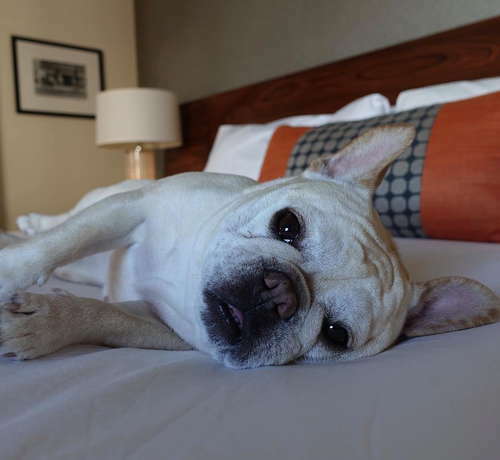 Let the front desk know about your furry companion and they’ll greet him with his own special care package, including a comfy bed, bowls, toys, a yummy treat, and a pet-friendly room service menu. 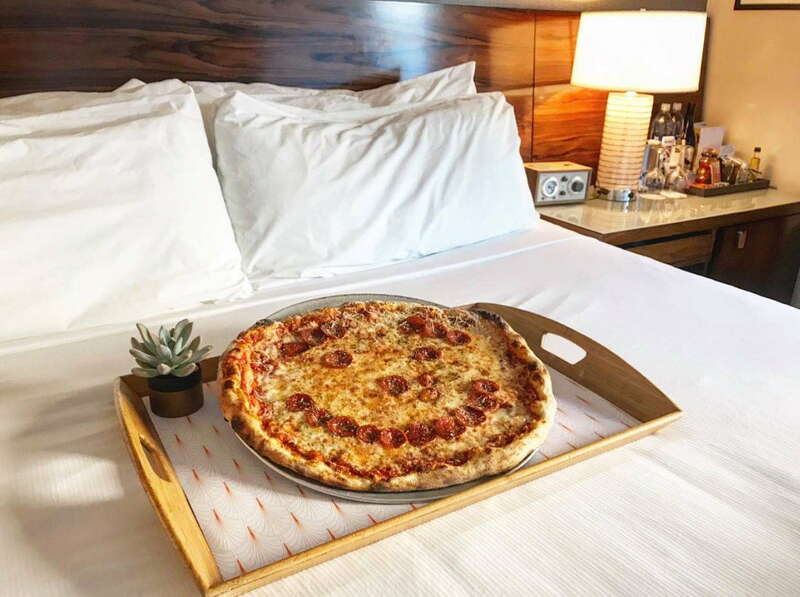 The rooms at Hotel Lucia are spacious and designed for your comfort, with pillow-top mattresses, fluffy bathrobes, luxury bedding, and a pillow menu to ensure you get just the right level of firmness. You’ll also find plenty of local Portland goodies (from beer to tea to spirits to snacks) to enjoy during your stay. The bathrooms at Hotel Lucia are impeccably designed, with contemporary finishes that mirror the look and feel of the rest of the hotel. YOU SHOULD KNOW While the bathroom design is spot-on, the size of the bathroom in the standard rooms definitely leaves something to be desired. Be prepared for a tight squeeze. The lobby of Hotel Lucia is artfully elegant. Featuring plush seating, an impressive collection of art (including photographs by the Pulitzer Prize-winning photographer David Hume Kennerly), and a variety of contemporary finishes (the light fixtures at the front desk are particularly interesting), this is definitely a spot you’ll want to spend some time in during your stay. The fitness room at Hotel Lucia is large and well-equipped, with plenty of cardio machines, free weights, and fitness accessories to accommodate their guests. 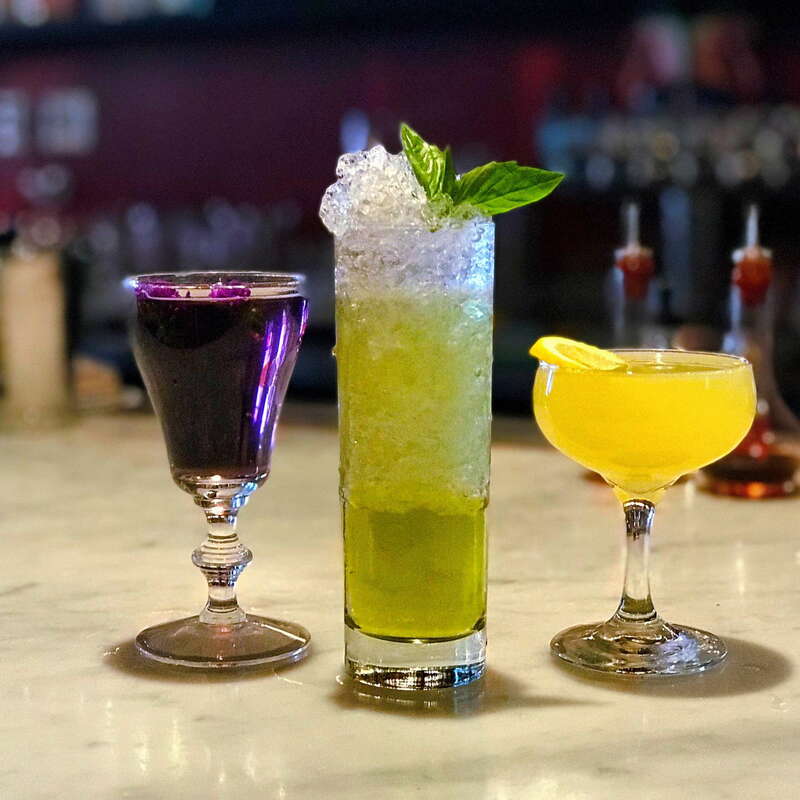 Inspired by the wide-open spaces of the Pacific Northwest, Imperial specializes in dishes cooked over the restaurant’s impressive wood-fired grill and rotisserie. Imperial is open for breakfast, lunch, and dinner, but make a reservation--this spot is popular with locals and guests alike. Portland is home to some of the best breweries in the country - and Hotel Lucia wants you to experience them. At 5:30pm every day, you can stop by the lobby and enjoy complimentary brews from some of the city’s top brewers. If you’re in the mood for something stronger, stop by The Crown, a cocktail-centric lounge just to the side of the lobby. 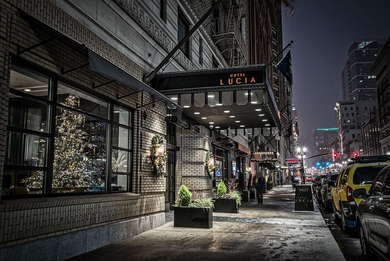 Hotel Lucia is in a very walkable neighborhood with easy access to public transportation (the nearest MAX Light Rail Station is just a few blocks away). If you want to travel like a true Portlander, stop by the front desk and ask to borrow one of the property’s complimentary bicycles. If you do bring a car, it’s $45 per day for valet parking. For something quick and casual (but still delicious), head over to the Alder St. Food Cart Pod (4-minute walk), where you can sample everything from kebabs to burritos to BBQ. Standouts include The Grilled Cheese Grill (The Jalapeño Popper is to die for) and Anna Thai Basil (which makes a mean Thai Fried Rice). If you’re looking for something more upscale, make reservations at Portland City Grill (5-minute walk). 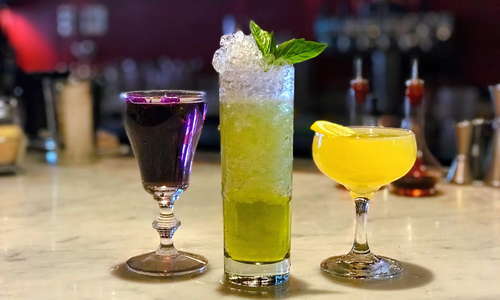 The restaurant, which is located on the 30th floor of the US Bancorp Tower (known to locals as “Big Pink”), has a traditional steakhouse menu - but offers the most stellar views in the city. Multnomah Whiskey Library (7-minute walk) is one of the hottest hot spots in downtown Portland, and for good reason - the bar boasts an impressive selection of over 1800 spirits (with a focus on high-end whiskeys), an inventive cocktail menu, and a cozy, library-like atmosphere that make it a favorite of locals and visitors alike. If you’d rather sample some of Portland’s famous local brews, head over to Bailey’s Taproom (2-minute walk), where you can sample one of their 26 rotating beers on tap - most of which are local. Hotel Lucia is, hands down, one of the best overall hotel experiences in Portland. 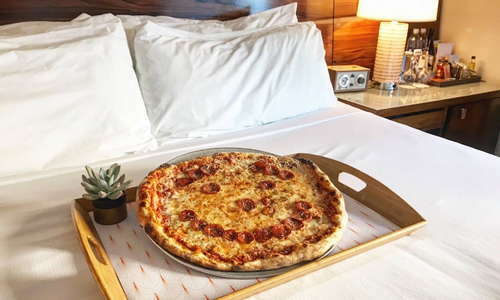 From the contemporary furnishings to the impressive art collection, the luxurious accommodations to the incredible focus on guest experience, Hotel Lucia is committed to ensuring you enjoy your stay in Portland from beginning to end.